More Ellis Island pages on this site are 22, 23, 25 & 26. While not everyone will agree with my view, it is a source of sorrow to the webmaster that most WWW sites choose to feature amazingly tiny images & so very often those images are of poor quality. Occasionally, however, one finds a superb image, made available by a website that surely agrees with my point of view. And here is one such image, actually just a tiny portion of one, dating from ca. 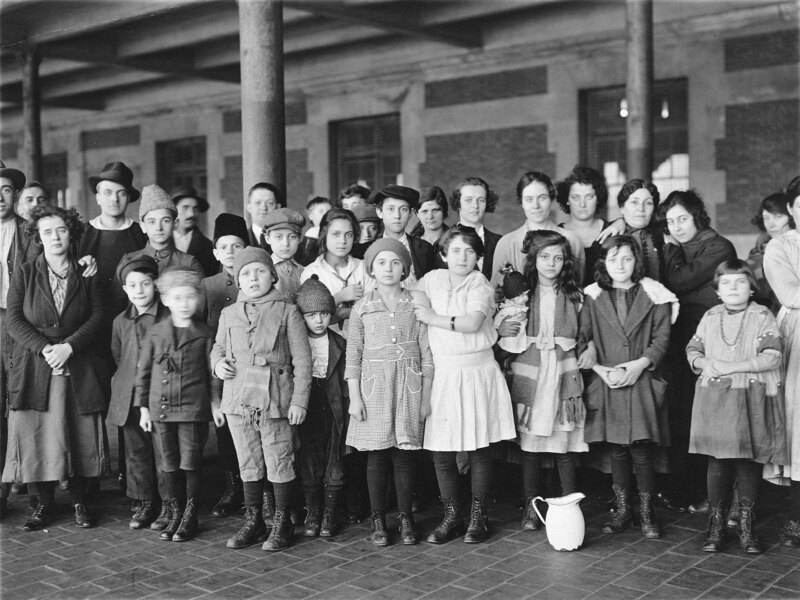 1908, of immigrant children at Ellis Island. The photograph was taken by 'Brown Brothers' & it comes courtesy of the records of the Public Health Service, whom I most sincerely thank. The full image & it is very big indeed, is available through this page & specifically here I show you here just a detail from that splendid that intrigued the webmaster & hopefully will interest you also. I mentioned earlier, I believe, that the Registry Room had a magnificent high vaulted ceiling. Well in 1916, there was a munitions explosion at nearby Black Tom Wharf in New Jersey, set off by German saboteurs. The explosion was giant & was felt, I read, as far away as Philadelphia. Ellis Island was extensively damaged as a result. In 1918 repairs & improvements to Ellis Island were effected & one of those improvements was the addition of a most beautiful terra-cotta roof vaulting system in the Registry to replace the previous ceiling which had collapsed. It was, it would seem, quite brilliantly executed by Raphael Guastavino (immigrated from Barcelona in the 1880s) & his son of identical name, & in its structure was nearly self-supporting. It had 28,000 individual tiles, & was a beauty to behold. I read that in 1986 the ceiling was cleaned as part of the necessary total renovations to create a museum & visitor centre. And only 17 of the original terra-cotta tiles needed to be replaced all those years later! I have seen, in a fine volume about Ellis Island, a wonderful image of that splendid tiled ceiling. And show you here part of a fine image of it, not from that book but rather taken, I think by 'Bruce and Priscilla' whose on line photo album is here (click on the image of the Statue of Liberty to find the full size original image). I can see no way to contact Bruce and Priscilla. So I will gladly remove the image from this page, should they so wish. But with regret. Because it is a very fine image indeed. And shows exactly what I wanted you to see. A fine print of steerage immigrants arriving in New York in the late 19th century - published in Frank Leslie's Illustrated Newspaper on Jul. 2, 1887. 'NEW YORK. - WELCOME TO THE LAND OF FREEDOM - AN OCEAN STEAMER PASSING THE STATUE OF LIBERTY: SCENE ON THE STEERAGE DECK' 'FROM A SKETCH BY A STAFF ARTIST. - SEE PAGE 327'. The image originates on this wonderful page at the Library of Congress. What a beautiful image! And a stunning partial image of immigrants on the deck of an arriving steamer. On the deck of the S.S. Patricia, I read, on Dec. 10, 1906. The work of Edwin Levick, (1869-1929). This image also originates from the same wonderful page at the Library of Congress as did the print above. Now there is another quite similar magnificent image available, of immigrants massed not on the deck of the Patricia but rather on the deck of the S. S. Amerika, arriving in New York. I have seen that image in a book, & while it is reproduced there in very great quality, I do not have permission to scan it for use on this page. I see that the image is attributed to & is in the 'Keystone/Mast Collection' at the University of California - most probably a copy of it since I presume it was widely distributed when it was originally issued. The image that I saw? On page 5 of 'Liberty: The Statue and the American Dream' by Leslie Allen. Do try to locate that volume & see the 8 1/2" x 10 1/4" full page image! Originally published by H. C. White. It would seem to have been a stereo image, which amazes me because of the incredible detail in every one of the many faces. The image could be seen by searching at this now inoperative link. I show the available large thumbnail at left, since I was unable to get you to it, at that link, at a single click! (I will gladly remove the thumbnail if it causes concern to show it here.) That U. of C. page states that the year of the image is not known. The book that I mention above says it, in fact, dates from 1905. It is indeed a beautiful image & is so appropriate for this page. Next, another superb partial image of immigrants on a hatch cover of an arriving steamer. A scene that I confess I could never be able to adequately describe in my humble words. It is yet another image that originates from that fine page at the Library of Congress. It is entitled Emigrants Coming to the "Land of Promise", dates from ca. 1902 & is the left image of a stereo pair. The photographer? William H. Rau, of New York, who could never, in his wildest imagination have thought that you, wherever you are in the world today, might see his work in this way, over a hundred years later. I have seen the same image in print elsewhere. The immigrants were said there to be Jewish & from Russia & the vessel was said to be ex Antwerp. But no vessel name was provided & may well not be known. But we now do know a little more. But we also have some further puzzles! The image appears in a truly fine volume of photographs published by K�nemann Verlaggesellschaft mbH of Cologne, Germany, entitled 'Liners The Golden Age' with images provided from 'The Hulton Getty Picture Collection' & text in three languages. A superb volume. The volume I have seen was published in 1999. That volume contains this image, with photographer not identified, but it appears backwards from what is shown below & at the Library of Congress site. The text states that the vessel was the Red Star Westernland, dates the image to 1901, & states that the immigrants are from central Europe. There would seem to be no lettering in the image that might indicate the correct direction. Or which, in fact, is the correct date. Very little is known about the following wonderful image which is from e-Bay, & an item which was sold in Aug. 2005 for U.S. $65.90. It was simply described as 'Immigrants at Ellis Island, 1920s'. Does any site visitor have the knowledge to identify the nationality of the group? The image was 9 1/4 x 6 1/2 inches in size. I trust I may be permitted to display the image on this informational & non-profit site. The very least I can do is to sincerely thank the vendor & provide a link to his e-Bay shop & invite you to drop by & see what he currently has on offer. A portion only, albeit the most significant portion, of another superb image made available by the Library of Congress, whom we most sincerely thank. Of immigrants gathered under the canopy at the main entrance to Ellis Island & awaiting inspection. It would seem that the name of the photographer is not known. And the dating is a range of between ca 1907 & 1921. You can see the full size image via this page. And the full image is here. Another fine image, or the major part of it at any rate, of a group of immigrants arriving. The webmaster does not, in fact, know where the image came from. He thought it was from one or another of the earlier links on this page. But that would seem not to be so. If it is in New York, as seems most likely, it would appear to be of immigrants perhaps exiting a customs shed or some other such building en route to Ellis Island. At times, it seems that I stray just a little bit off topic! But the following fine partial image surely merits inclusion here because of its visual interest & location. The image is of Hester Street in Manhattan in 1910, the heart of the then Jewish district in New York, & surely the destination of many of the Jewish immigrants who came through Ellis Island. The image originates, I understand, from the National Archives, Library of Congress. Should any site visitor have available a large electronic image of the photograph, I sure would like to receive. it. And any available detail as to the photographer etc. - data I do not now possess. The image reminds the webmaster of the markets of the East End of London, England, in the 1950s. The webmaster did not have any idea as to where the next image came from. But he some years ago 'found' it again via a Google image search, on this 'family Ragozzino' page. Or I should say it was on that page, since the top two image links seem no longer to work. It is of Mulberry Street, in Manhattan, in the early 1900s. It relates well to the previous image of Hester Street & indeed is very close by. I could not spot on that 'family Ragozzino' site the origin of the image or any background data, but I do thank them for locating it & featuring it on their site. I read that the street was named for the mulberry trees that once lined 'Mulberry Bend' & that since the 1880s it has been the heart of Little Italy in New York City. It may very well be that this street was Dr. Seuss's famous 'Mulberry Street'. Theodor Seuss Geisel (Mar. 2, 1904 / Sep. 24, 1991), better known as Dr. Seuss, was living in New York City when in 1937 he wrote 'And to Think That I Saw It on Mulberry Street', his very first book. However, there is some small doubt about that. There was also a Mulberry Street in Geisel's hometown of Springfield, Mass. The manuscript was, I read, rejected by no less than 27 publishers (though I have also read 28 and 43 publishers! ), and Theodor was going home to burn it when he met a friend who worked at Vanguard Press. And, as they say, 'the rest is history'. But, I digress. Just enjoy the fine image!